The River to River Trail is a 160 mile (256 km)-long hiking trail that serves Shawnee National Forest in far southern Illinois. The trail is used by both equestrians and hikers. About half is on off road trails. Its eastern terminus has historically been Battery Rock, overlooking the Ohio River but now generally Elizabethtown, Illinois is used as the eastern terminus. 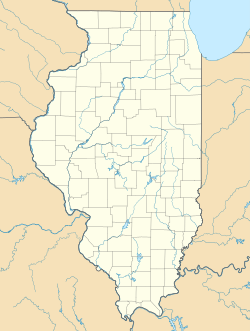 The western terminus is in Grand Tower, Illinois, at the Mississippi River. Sections of the River to River Trail form part of the Southern Section of the American Discovery Trail. The River to River Trail Society has published a guidebook to the trail's campsites, orientation, safe water sources, and other useful information. A significant spur trail serves Elizabethtown, Illinois. ^ a b "River to River Trail". River to River Trail Society. Retrieved 2009-05-09. ^ a b Zyznieuski, Walt (2009-05-07). "Exploring the Shawnee National Forest". Illinois Times. Retrieved 2009-05-09. Hiking Project Downloadable gpx from 2017. More points than OpenStreetMap.